Playing with My Favorite Things! Back again with some MFT fun! I adore these Scribbles dies and I think they make the funkiest of flowers and now that I’ve found Xpress it A4 double sided adhesive everything is getting glittered, even the leaves! 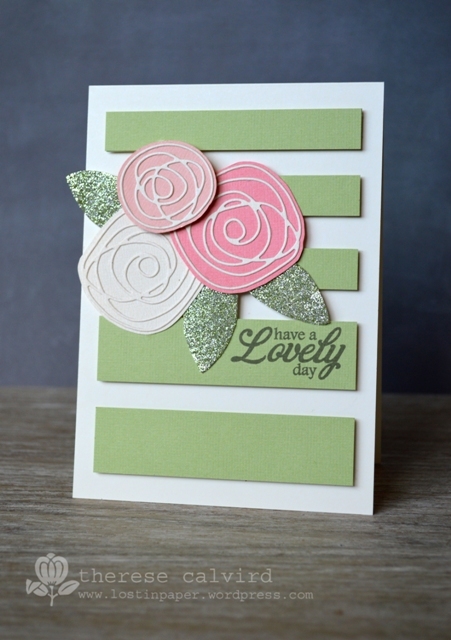 I kept the card design quite simple as I wanted the flowers to be the centre of attention. I would like to submit this to the Card Design Superstar Contest at My Favorite Things, where the gallery is already jam packed with the most amazing cards! Other Supplies: Martha Stewart glitter – green agate. Cardstock American Crafts – Vanilla, Peach, Cantaloupe. < Previous Video : Beware the Gold! Next > Time for another Challenge at Scrapbook Boutique Bloghop & Giveaway! Love the flowers!!! Very pretty!!! Oh YOU are so winning this, Therese! LOve the colors you’ve chosen, and the scribbles are scrumptious! Beautiful! 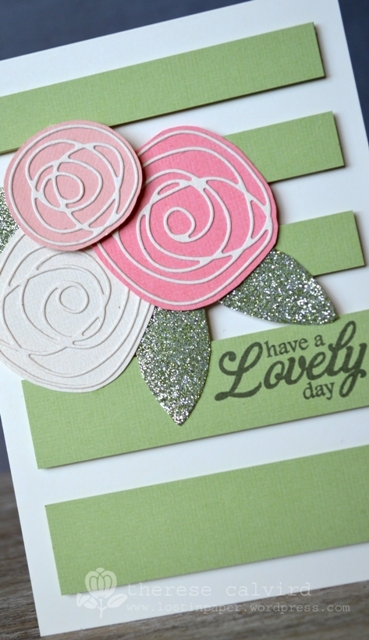 You ARE a superstar Therese – your cards are always inspiring, unique and, well, STARS! Good luck with this gorgeous creation! what a lovely card. the stripes were a wonderful sight. l love the flowers. I so much enjoy your work and your videos are lovely. Brilliant entry, love the colours you chose and the little bit of glitter. Just perfect. So want those scribble roses. A very lovely card for a future Superstar! Love those gorgeous stripes, too, Therese! Yes, those Xpress It adhesive sheets are lots of fun! My problem is that I can’t stand getting glitter everywhere! But your glittery goodness is really lovely. I love the background and the flowers with glitter leaves. Beautiful card!!! I have doing a card with flowers too. I will want to participe in MFT superstar. Wonderful card, I, too, like the scribbles flowers. Very unique. The striped panel looks awesome 🙂 love the choice of colors you made !! Glitter leaves? What a great addition to those beautiful scribble flowers, Therese.